PowerShell: PowerShell for every system! Can I say it as "PowerShell Core 6.0"
To download PowerShell Core on Windows, see https://aka.ms/getps6-windows. To download PowerShell Core on macOS and Linux, see https://aka.ms/getps6-linux. You can contribute to the development of PowerShell and access its source code freely, PowerShell is a multi-platform and can be installed: Windows, Linux, MacOS, and even Raspberry Pi! Small flat, however, this change of architecture can affect your old script. You have to test them because some features may not be missing because the .NET Core does not have all the operational coverage. Another good news: You can install PowerShell 6 without leaving anything in the previous version of Windows PowerShell. Indeed, PowerShell 6 operating system separately installs in a directory and it embeds .NET Core. Establishing is as minimal as a prerequisite! What's the difference between Windows PowerShell and PowerShell Core? What's New in Windows PowerShell 5.0 Windows PowerShell 5.0 includes significant new features that extend its use, improve its usability, and allow you to control and manage Windows-based environments more easily and comprehensively. Contains updates for Windows PowerShell and Windows PowerShell ISE. note: You will need .NET Framework 4.5. We will see how it helps in getting only table without header and footer information while fetching windows roles, So that you can load data into some object and then you can work on it. Scenario 2 : if you fire below command then you will get data without header and footer using Skip top 12 lines of header and last 2 lines of footer. After that I use this info for enable and disable role using User interface using c#. I've read through TechNet forum threads where customers scoffed that somehow Microsoft would be able to make PowerShell 4.0 available in October 2013 - so soon after the release of Windows 8.1 and the R2 wave. But, it happened, and it's here. PowerShell 4.0 comes preinstalled for Windows 8.1 and Windows Server 2012 R2, but there are those who still prefer Windows 7 and other earlier server operating systems. So, it's great to see that Microsoft has finally released PowerShell 4.0 as part of the Windows Management Framework (WMF) 4.0 release. The release supports Windows 7, Windows Embedded Standard 7, Windows Server 2008 R2, and Windows Server 2012. Windows PowerShell Desired State Configuration (DSC) Download WMF 4.0 here: Windows Management Framework 4.0 P.S. WMF 4.0 also requires Microsoft .NET 4.5 be installed first. Now that Server 2012 R2 has been released, PowerShell 4.0 has also become available. Unfortunately it is not yet available as a standalone download, older operating systems will have to wait for the Windows Management Framework to become available as an optional download. Desired State Configuration - This allows for configuration of a computer in a way that was previously not possible with PowerShell. Get-Process now supports User names - No more Get-WmiObject -Class Win32_Process!! Several language improvements and bug fixes. PowerShell Providers are .NET programs that allow us to work with data stores as if they were mounted drives. This simplifies accessing external data outside the PowerShell environment. For example, we can access the registry as if it were a file system. This translates to being able to use the same cmdlets as working with files and folders, which are shown in the table below. Removes a File or directory. Creates a new empty file or folder. Clears the contents of a file. Set the contents of a file. Sends contents of a file to the output stream. is presented in a consistent format that resembles a file system drive. easily view and manage it. The data that a provider exposes appears in a drive, much like a hard drive. designed especially for the data. The providers can also add "dynamic parameters" to the built-in cmdlets. A Provider is also called a "snap-in" which is a dynamic link library (.dll) built into PowerShell. A library is code that instructs PowerShell to preform an action when we execute a command. What this means is that we no longer have to write code, as we did in VBScript, to connect to the registry. The code is provided for us, simplifying our efforts. New and Custom Providers can be written, but this goes beyond the scope of this tutorial. The PowerShell Software Developers Kit provides documents should you wish to build your own Providers. The "Name" column reveals the PSDrives available on the system. We connect to each Provider using the PSDrive appended with a colon (:). Note: The example in image 5.1 shows the PSDrives without the (:) so you have to remember to use it when mounting a PSDrive. Let's use this PowerShell training session to explore each of these providers. We discussed what an Alias "is" in PowerShell tutorial 3. The Alias Provider enables access to all the aliases in PowerShell. To mount a PSDrive we use the "Set-Location" cmdlet. In this example, we want to mount the "Alias:" PSDrive. Don't Forget the colon(:). As shown in image 5.2, we are now connected to the "Alias:" PSDrive. Just a quick note, PSDrives are only available in the PowerShell environment. You would not able to access the "Alias:" drive from a legacy windows command shell. Now that we are mapped to the Alias: PSDrive we can use the same cmdlets as working with files and folders. Eample 1. View a list of all aliases. Example 2. List the properties and methods. Example 3. Use the -Name parameter to list all Aliases that start with the letter "R". PowerShell supports the use of wild cards() to filter the results. Example 4. Building on example 3; instead of using a parameter to filter results, let's filter using the "name" property of the Alias object. We have worked a lot with aliases in a previous tutorial, so I'm going to move along to the next Provider. Feel free to use the commands listed in the table (above) and experiment with the Alias Provider. You may already be familiar with what the Environment Providers is, it is equivalent to running the "set" command in a windows CMD command shell. It provides a listing of all the environment variable defined on the system. Graphically, you can view the environment variables by going to System Properties -> Advanced Tab -> Click the "Environment Variables" button. 1. Get list of available PowerShell Providers. 2. Map PSDrive to Environment Provider. 3. Get listing of Environment Variables. 1. Output the value of the "OS" variable. 2. Output all properties for the "OS" variable. 1. Create a new variable using the "New-Item" cmdlet. Let's call the new variable "MyVariable" and give it a value of "This is my new variable." The Path argument will be a dot (.) meaning current location, which would be "env:"
Use "Get-ChildItem" cmdlet to verify that the new variable exists. 1. Let's rename the "MyVariable" variable to "MyRenVar." 2. Now use the "Get-ChildItem" cmdlet to verify the change. 1. To remove the "MyRenVar" variable we us the "Remove-Item" cmdlet. 2. Use "Get-ChildItem" to verify the variable has been removed. By default, the File System Provider is accessed when PowerShell is launched. The File System Provider allows you to create, retrieve, and remove files and folders. Also, the File System Provider allow you to modify files by either appending or overwritting data. This section of the PowerShell Providers tutorial explains how to do this. 2. List Files and Directories under the root of C: Drive. 3. List Files and Directories including sub-direcories. If your file system is large, the command in step 3 may take awhile. Use "Ctrl + C" to stop processing commands in PowerShell, just like you did in CMD command shell. What is the "Mode" column? 5 bits of information you need to know. · First entry is either "d" (indicates item is a directory) or "-" (indicates item is a file). · The last 4 entries present the properties of a File and/or Directory (a r h s). "a" = archive bit is set, "r" = read only, "h" = hidden, and "s" = system. A "-" in any of these entries means the bit is not set. Note: By default, "Get-ChildItem" cmdlet or an Alias does not show hidden files and Directories. To show hidden files use the "-force" parameter. As stated earlier in this PowerShell tutorial, Providers allow the use of the same cmdlets. Here is a second look at the cmdlet table, so that you don't have to scroll back to the top. Use "Get-Location" to show current directory. Using Alias and CMD Command. Use "New-Item" cmdlet to create a New Directory. A cool thing about PoweShell, it will assist you when you leave out required information. For example, let's say your creating the directory in the example above but you forget the -Type paramter. Continuing with the "New-Item" cmdlet, let's create a file in our new directory. Let's rename the NewFile.txt to RenFile.txt. Verify the file has been renamed. Rename Directroy NewFolder to RenFolder. in our last example of this PowerShell training section, let's remove the RenFolder and RenFile.txt. 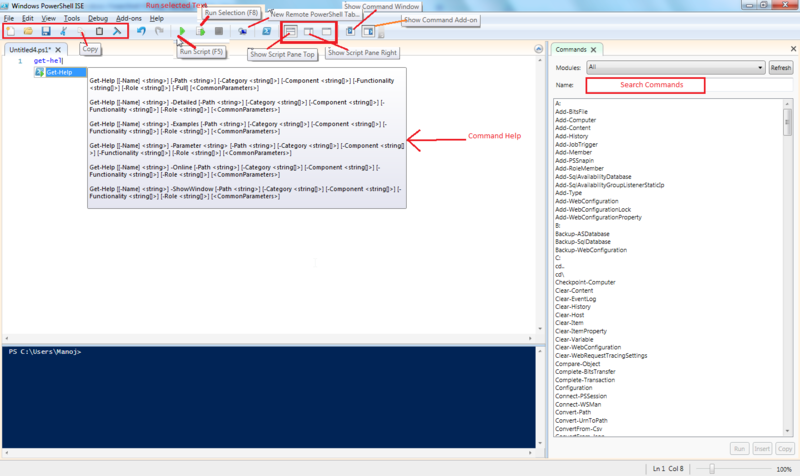 Just for fun, let's add the -confirm parameter so that PowerShell prompts us to confirm the action. Press "Y" to confirm the deletion of the file and verify the files has been removed. You should still see the RenFolder but the RenFile is no longer present. Now remove the directory. Again, press "Y" to confirm and verify Directory has been removed. There are other cmdlets such as "Clear-Item" and "Set-Item" that enable you to work with data within files. Use "Get-Help" on these cmdlets to read about how to use these cmdlets in the PowerShell FileSystem Provider. I personally like to use "Get-Content" to output a files contents to the screen and "Set-Content" to add information to a file. PowerShell has a set of Functions specified in the PowerShell engine. The PowerShell Function Provider allows us to access these functions using, hope this is starting to sound redundant, the same cmdlets as working with Files and Folders. Not familiar with what a function is? A function allows you to make calls to a block of code. When scripting, if you notice that you are using the same code over and over (within the same script), you should consider creating a function. A function would reduce the amount of code and keep your scripts clean and readable. The examples in the section will help define a Function. Be aware that we are discussing Functions defined in PowerShell, not how to create PowerShell Functions. Creating your own Functions comes later in the PowerShell Scripting tutorials. 1. Use "Set-Location" cmdlet and connect to the PowerShell Function Provider's PSDrive. Image 5.10 displays the Functions that are defined in PowerShell. "Name" is the name given to the function and the "Definition" is the code that runs when we call the name. What does it mean to "call" a function? In PowerShell, we are only required to type a function name and the corresponding code will execute. For example, typing "set-Location C:" navigates to the root of C: drive. We can also navigate to the root of C: just by typing(calling) the "C:" function name. PowerShell runs the "Set-Location C:" code which places us at the root of C: drive. Let's take a look at another example. 1. We are going to use the "Get-Content" cmdlet to view the code block of the Clear-Host Function. So my guess is that you would be more inclined to calling the "Clear-Host" function than actually typing the code required to clear the screen. Can you see how calling a function reduces the amount of code written in the script? Before getting in too deep and making your head swim, I'm going to end this discussion about this Provider until we talk more about PowerShell Functions and Scripting. For now, let's move on to the coolest PowerShell Provider in the world!!! Manage ACLs (Access Control Lists). Eample 1. Connect to the HKLM PSDrive and List Registry Keys. 1. The two PSDrives we can connect to are HKLM and HKCU. Verify this by checking which PSDrives are available. 2. Connect to HKLM PSProvider using the "Set-Location" cmdlet. 4. From the Software location let's list the keys available. We're all familiar with the warnings of making changes to the Registry. Since I wish to only help and do no harm, I'm not going to provide examples of making registry changes. Just note that you can use the same cmdlets used when working with all PowerShell Providers. Note: In the -Path parameter, quoting the path statement was required as there is a space between Windows and NT. You should now see a list of "Hot Fixes" that have been installed on the system. Staying with the theme of this PowerShell tutorial, I'm going to use the "CD" alias to navigate to one of the "Hot Fix" keys. Choose any hot fix you wish to enumerate. Next question should be... How do we enumerate the information inside the registry key? Simply use the "Get-ItemProperty" cmdlet. Now we see all the properties, how about just a specific property? First, Let's work from the root of SOFTWARE. Create new registry Key and Default Property using "New-Item" cmdlet from the table. Verify the default property has the string value we created. Next, Let's delete the new key using the "Remove-Item" cmdlet. Verify the key has been removed. Using the Registry Provider we are able to navigate, enumerate, create, and delete registry items just like files and folders. Real-World Example: An associate of mine started working for a banking institution. We're talking multiple locations around the United States. His boss didn't like the naming convention for network printers as they provided no clue of printer type or location. His task was to create new print queues (with a new naming convention) and cut all the user over to the new print queues. Because he was dealing with multiple locations, it was impossible for a tech to be on-site to remap clients to the new print queues. Another requirement was to automate the process so that clients would not experience down time when printing. He told the boss... "No Problem." I'm only going to describe what he did in pseudo code as it would take another tutorial to examine his script. Network Print Queues are stored in the registry as a UNC (\\PrintServer\PrinterName). He created a second print queue for each printer on all his print servers. Created a printer script which used an array to store the old printer names and their new counterparts. The script would change the registry setting from \\PrintServer\OldQueue to \\PrintServer\NewQueue while also preserving the default printer setting. He replicated the new script to all Domain Controllers in his environment and edited the company's logon script to call the printer script. When the printer script runs, it looks at the registry keys and if it finds reference to an old print queue name, it would edit that key with the new value. He allowed the script to run for a month or two to ensure that everyone using shared PCs would get the new print queues. After that time period, if he received calls from clients stating they could not connect to a new printer, he would just turn on the print script (uncomment it in the main logon script) and ask the client to re-logon the Domain. This example shows just how powerful connecting the registry can be. Needless to say, his boss thought he was brilliant (which he is) an sent him off to Hawaii (ok - maybe not! But it is a nice thought). What is a variable? I like to think of a variable as a "little box" that is used to store information. The Variable Provider shows us which PowerShell and user defined variables are available. Again, we will be working with variables when scripting, so this is just an introduction. Use.. What Command to list variables? In PowerShell, variables are preceded by the dollar sign character ($). However, the list of variables in example 1. don't show a "$" sign. To view the information stored in the PSHome variable, just add the "$" before the variable name. The $PSHome variable holds the information of the PowerShell installation path. Check out the information stored in other variables such as the $Profile and $Home variables. Let's sort the listing of variables by name and verify our newly created variables exist. Do you see MyVar, MyVar2, and MyVar3 user-defined variables? By now your asking yourself, what is $_.Name? We can see that $_ must be a variable (all variables are noted by the dollar sign in PowerShell)... and it is. As defined, variables hold information. $_ is a special variable the holds the object piped from the "Get-ChildItem" cmdlet. The .Name is the Name Property of the object. I know your sick of me saying this but, we will explore script blocks in a later PowerShell tutorial. Here is the last PowerShell Provider we need to cover. Using "Get-PSDrive" cmdlet we can see that we need to connect to the "cert" drive. What is new Powershell 3.0? Windows PowerShell 3.0 includes many features that are designed to make its language simpler, easier to use, and to avoid common errors. The Auto-complete feature saves typing time, and reduces my typos. As you begin to type a cmdlet so you see a pick-List of likely nouns to append to your verb. Property enumeration, count, length properties on scalar objects and New Core Cmdlets. Persistent user-managed sessions ("PSSessions") that you create by using the New-PSSession cmdlet are saved on the remote computer. They are no long dependent on the session in which they were created. Note:The Disconnected Sessions feature is supported only when the computers at both the originating ("client") and terminating ("server") ends of the connection are running Windows PowerShell 3.0. Also supports Robust Session Connectivity means PowerShell 3.0 detects unexpected losses of connectivity between the client and server and attempts to reestablish connectivity and resume execution automatically. Integrated Scripting Environment (ISE) has many new features, including Intellisense, Show-Command window, a unified Console Pane, snippets, brace-matching etc. When a member of a known module is accessed, the module is automatically loaded into the PowerShell session. Windows Server 2012 feature that lets users run Windows PowerShell commands and scripts in a web-based console. Microsoft Windows PowerShell 3.0 marks a significant advance for the Windows network administrator. It is combination of the power of a full-fledged scripting language with access to command-line utilities, Windows Management Instrumentation (WMI), and even VBScript. Windows PowerShell provides the power and ease of use that have been missing from the Windows platform since the beginning of time. Perhaps the biggest obstacle for a Windows network administrator in migrating to Windows PowerShell 3.0 is understanding what PowerShell actually is. In some respects, it is a replacement for the venerable CMD (command) shell. You can still use cd to change the working directory, and then use dir to produce a directory listing. You can also combine traditional CMD interpreter commands with some of the newer utilities, such as fsutil. Above commands we used in an interactive manner. You can group them together like a batch file. 1. Start Windows PowerShell by choosing Start | Run | Windows PowerShell. The PowerShell prompt will open by default at the root of your Documents folder.